I've been aware of it all week, but haven't had the heart to write about it until today. I was alerted to a great Canadian website earlier in the week and it brought my own diagnosis home again, as well as my concerns regarding having Erik diagnosed. Since then it's been sitting there on one of the channels of my brain, but I haven't done anything with it. You see, my diagnosis was never conclusive. Partly because it happened twenty-one years ago when ADD was still a new thing and people weren't really sure what it was - what to include in the diagnosis and what to exclude from it. The fury over medicating the symptoms was white hot back than. It's still glowing hot now, but I think it is far more accepted than it was throughout the 1990s. People still consider ADD and ADHD to be a pseudo-syndrome. Some people still don't really believe it exists. Being inside my head is like having several radio stations all playing at the same time so it's hard to just listen to one. You'll find that quote under point 4 on this page. This has been my reality all my life, I have four distinct trains of thought all running at the same time in my head and once in a while I'm able to focus in on one, but that focus never lasts and more often that not, mid-thought, mid-sentence, I'll find myself drawn into an entirely different line of thinking (which often seems to me to be related, but to others it comes out of left field). Ah, and therein lies the rub. As a person with ADHD symptoms, I am not able to shut out the other lines of thought. I have them and they intrude and I lack the ability - however hard I try - to ignore them. Or maybe you don't have the multiple channels going at once in your head? This doesn't mean I don't have them. To that I would say firstly, I have never been medicated. When given the option back in 1991, I decided not to take it. I did accept an offer for cognitive behavioural therapy, and that has helped me enormously - though it has limitations. Secondly, I would say, if battling your 'natural' tendencies is a daily struggle which impedes your life in some way, then certainly, it may be natural, or normal, but it's not conducive to a productive and fulfilling life and that, in my humble opinion, is a real disorder which should be managed, if at all it can be. My mum is currently having her own symptoms investigated and I am immensely grateful that she is. If she is diagnosed one way or the other it will help clarify my own conditional diagnosis (they said I had all the symptoms but couldn't conclusively diagnose me because of my abnormal brain structure). It would also help me make a decision about having Erik assessed for ADHD. At this point in my life, I would seriously consider medication for myself. One thing I hadn't read before about ADHD and 'impaired executive functions' is that this affects 'Managing frustration and modulating emotions (worry, disappointment, anger)'. This has been my biggest obstacle in life. When I feel frustrated, it consumes me. When I feel angry, it consumes me. When I feel sad, it also consumes me. I act and speak while consumed by my emotions - and much of this blog will reflect the struggle I have had with this. 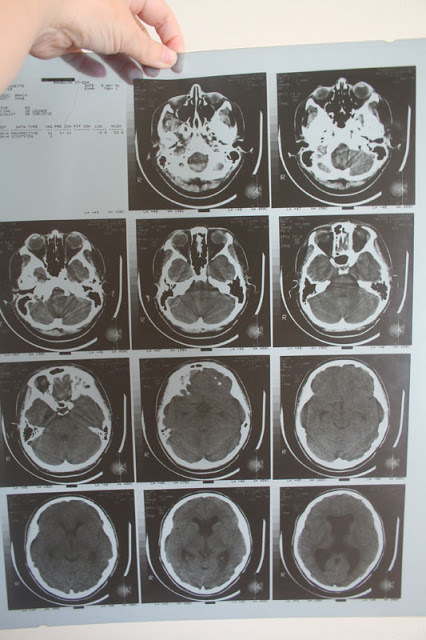 Interestingly enough, when I was pre-teen and had my first cat-scan, the doctors at the hospital told mum that part of my brain malformation meant she should expect greater than normal mood swings in me as a teenager because I would have an impaired ability to control my emotions. She was told this in the mid-80s, when ADD wasn't much known about. They foreshadowed my future diagnosis - whether or not it was due to ADD or abnormal brain structure (some studies into patients with ADD have found discrepancies in their brain structure and function, not the same as mine, but with the same outcome regarding impaired executive functions). As you can see, the dark patches on my brain are the 'missing bits' and they are also the dark parts on the brain of an ADHD subject. Coincidence, I think not. All of this has been playing on my mind this week. I live with the symptoms of attention deficit (hyperactivity) disorder which is complicated by the abnormal structure of my brain. 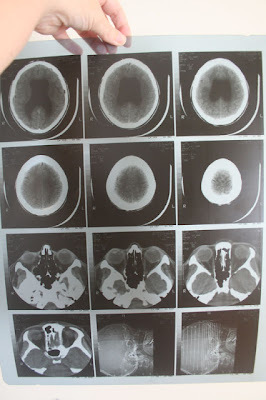 Other family members (with normal brain structures) live with the same symptoms - maybe I was just lucky that my particular brain malformation covered an area which would have been affected anyway, thereby minimising the number of unusual symptoms I have had to live with? 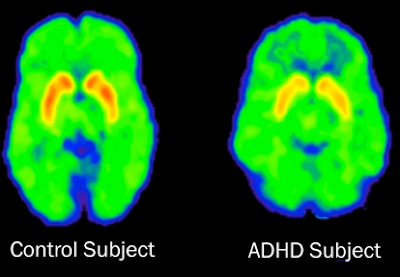 Whatever the case, my symptoms are real, whether other people believe in ADHD or not.